TAKE UNLIMITED WEIGH DOWN CLASSES PAY MONTH TO MONTH - NO COMMITMENT! Unlimited Access via Streaming to ALL Weigh Down Classes and Class Materials (Videos, Audios, downloadable workbooks and class reinforcement materials). Access to a Video & Audio Library: Audio & Video Lessons on more than weight loss including: parenting, marriage, finances, overcoming anger, depression, anxiety and content for teens and kids! 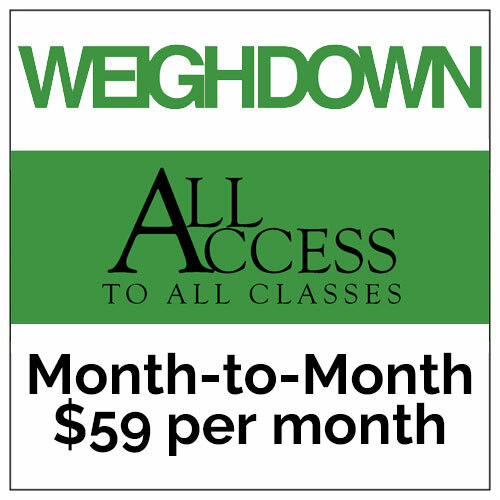 The cost for WeighDown All Access Month-to-Month is only $59 a month. You can cancel at anytime, however there are no refunds for partial months. We also offer a Year Contract for $24.99 a month. If you have more than 4 members in your household who are actively using one account, we suggest you purchase a second account. Service begins as soon as your order is processed. Your subscription will continue without renewal notice until you cancel. If you cancel within 3 days of your initial order, you’ll be fully refunded. Should you cancel after 3 days, your payment is non-refundable and your service will continue until the end of that month’s billing period. Because there’s no annual contract, your monthly rate is subject to change, but you will be notified of any change in your monthly rate with the option to cancel in accordance with these terms. Cancellations can be made by visiting your Your Account page or by contacting the Weigh Down office at 1-800-844-5208 and speaking with a representative.